more to see, do, and eat in the islands. Take a taste of the Caribbean home for yourself and foodie friends. 1. Morne Delice Nutmeg Syrup, from Grenada: Made from the fruit, or pericarp, that encases the nutmeg, this fragrant syrup gives pancakes, waffles, and ice cream a tropical twist. It’s a great substitute for simple sugar syrup in rum punches too. 2. Nutmegs with the mace still intact: A chance to one-up your foodie friends. 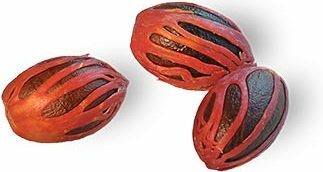 Since whole nutmegs aren’t sold this way in North America, many people don’t realize that the nutmeg tree produces two different spices. Look for them in the produce markets of Grenada, St. Lucia, and other rain-forested islands. 3. Curry Powder: West Indian curry powder is distinctive – and very different from its East Indian counterparts. In Trinidad, I like the “Tadjah Mahal Special Madras Curry Hot and Spicy Blend for Duck and Goat,” made by Turban Brand Products, as well as the homemade blends (with pieces of whole bay leaf and dried pepper in them) available from a few vendors in the Port of Spain fresh market. In the French islands – St. Martin, Martinique, and Guadeloupe – try the Creole curry blends called colombo. 4. Vanilla beans and vanilla extract: Look for beans that are supple, fat and fragrant. (Ask where they’re from before buying: The vanilla beans in some island markets are imported!) On islands such as Grenada, you won’t commonly find beans for sale, but you will find good bottled vanilla extract. 5. Tropical fruit jams: Look for flavors such as guava, mango, passion fruit, pineapple, tamarind, and sorrel. Grenada’s Morne Delice makes a dynamite nutmeg jam. We also particularly like the strongly fruity confitures available in Martinique and Guadeloupe; read the labels and look for ones sweetened with cane sugar rather than high- fructose corn syrup. 6. Bottled green seasoning: This marinade is great for giving meat, chicken, and fish an underpinning of Caribbean flavor. We’re partial to Paramin Seasoning, made by the Paramin Women’s Group in Trinidad, though each island has its own brands (as well as homemade versions sold in local markets). Read the ingredient list – you want lots of herbs and few additives. 7. Pepper sauce: Yes, there’s flavor underneath the heat, and they can vary dramatically in taste. If you like the pepper sauce you’re served in a restaurant, ask who makes it. If it’s house made, you may be able to buy a bottle. 8. Cocoa balls and sticks: Essential for making island “cocoa tea” and other treats, these are pure cocoa beans that have been fermented, dried in the sun, roasted, crushed to a paste, and hand-rolled into balls and sticks. They sometimes come packaged with a recipe or two – great for gift-giving. 9. High-quality chocolate made locally from locally grown cocoa beans: We’re hooked on the Grenada Chocolate Company’s organic 71% cocoa chocolate bars, and its pure cocoa powder. Not yet off the ground, but keep an eye out for Hotel Chocolat products made in St. Lucia. 10. Rum, particularly aged sipping rums that are difficult to find in North America. Visit the distilleries – and their tasting rooms. Three of Steve’s “everyday” favorites (meaning not kept just for special occasions) are Haitian Barbancourt (in particular, the eight year old), Neisson Rhum Vieux or Rhum Extra Vieux (from Martinique), and the House of Angostura’s 1919 (made in Trinidad). • Don’t leave home without a collection of zipper storage bags, so you can double-bag your purchases before packing. • Go beyond the stores geared to foreign visitors and shop where locals shop for their own homes. You’ll find a more interesting selection – and, often, better prices. • Check out the housewares sold in markets and food shops for items that are “usable decor.” A couple of dollars can buy you an unusual citrus juicer, a nifty swizzle stick, or a rustic mortar and pestle. • Saffron alert: Don’t be seduced by the very large bags of saffron selling for a very low price. “Saffron” is the name used in the West Indies for turmeric. • Coffee can be a tricky buy, unless you’ve had a chance to sample: In some places, the best beans are exported, leaving the lower-quality ones for local consumption.